When we arrived this past weekend, about two-thirds of the drywall board had been installed. In terms of progress, all of the drywall in the basement was completed and all of the ceiling on the main floor. Left to complete is the majority of the walls on the main floor. Here you see the doors leading to the two bedrooms in the basement. 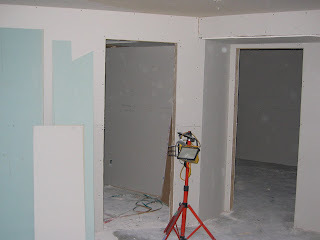 In the next post we will discuss the different types of drywall and there various merits.